When we say we’re on a mission to make great pizzas, we mean it. But what makes a pizza great? 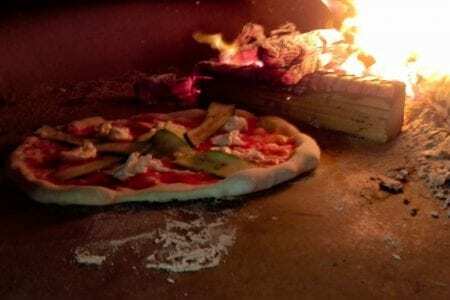 We like to think that by following the traditional craft of pizza making and by making each part of the process as good as it can be you end up with very specials results. We start by making all of our own dough using just four ingredients (flour, water, salt & yeast), slowly proving it for up to 48 hours to give it maximum flavour. It’s then hand shaped before being blasted in our traditional wood burning oven for about 90 seconds at over 450°C. The high temperature cooks the dough perfectly, giving a crisp base and a light, fluffy crust. We’re committed to using the finest Italian ingredients and the best locally sourced produce we can find. We vary our menu depending on the season and what we can get our hands on – we’re always on the lookout to try new things and see what direction our tastebuds take us in. The perfect end to your perfect day. From engagement parties and rehearsal dinners, to casual wedding dining and everything in between, we have a package to suit everyone. You and your guests will love the spectacle of our delicious pizzas being made by hand and cooked in front of you. Our gorgeous, retro van only adds to the sense of theatre and will grace any venue. If you’re looking for more than just pizza, we also offer an extensive menu of other items. Call us to learn how we can help to add a bit of wow-factor to your special day. Everyone loves pizza and your employees are no exception. Want to make your staff party the hottest ticket in town? Pulling out all the stops to impress that super-important client? Or maybe you just want something to really bring people together on your team building activities? Whatever your corporate function we’ve got you covered. Give us a call to see how we can make your next event one that your staff will thank you for. 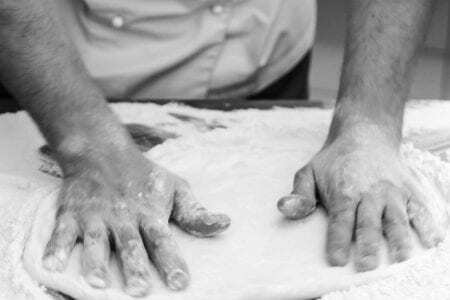 Whether you’re planning a Christening or turning 70, having an awards ceremony or a village fête, or even organising your own sporting event, there’s little that wouldn’t be improved by having freshly made, traditional pizzas there to feed everyone. All we need is the space to park up and we can ply you and your guests for hours on end. Call us to see how we can bring a unique experience to your event. We Instagram. Come and connect with us @pompierepizzaco. "The best pizza I've ever had, and you can quote me on that!"